Hello everyone! Hope your Tuesday/Wednesday is going well. Lately I have been reading blogs that have “Wordless Wednesdays.” Have you ever heard of that? It’s when blogs have a series of pictures, or one picture instead of a prose post. I do not think I’ll start doing Wordless Wednesdays, but I did want to share some fun pics I took of writing in Seattle yesterday with you. Nothing serious today- just fun Seattle sunshine and latte art from a place you should definitely check out- Zoka coffee shop. 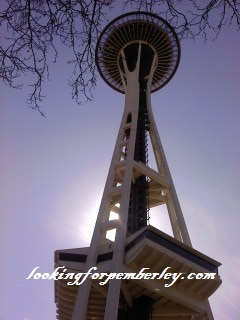 Love it when the sun comes out in Seattle! Ah, I love my coffee while writing. It makes me more productive, although I usually don’t order lattes. Just regular black coffee. I am also very glad to have finally found a few places that serve delicious lattes (although coffee is everywhere here, truly great coffee shops are bizarrely difficult to find in Seattle, which shocks me). 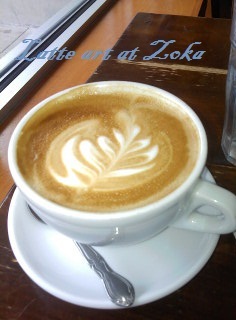 Zoka definitely makes one of the best lattes I’ve ever had in my lifetime. In other good news, these pictures were all taken with my cell phone camera, as are many of the ones I post here. If you have a larger screen, you might be grossed out by the poor image quality/ pixels. However, my wonderful friend gave me an old Nikon digital camera yesterday. As you might have guessed, I will use it to take pictures, and will then post those (way better than cell phone quality) pictures to the blog! I’m very excited about it, and hope that it will make your reading experience better. Do you drink coffee while writing? Something else? Nothing at all? 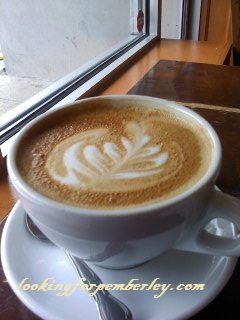 This entry was posted in Fun, Writing and tagged cameras, coffee shops, creativity, latte art, Nikon, Seattle, writing, Zoka. 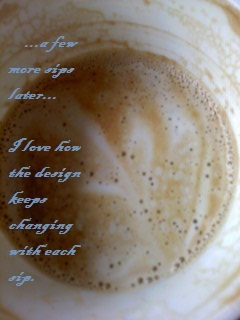 I love drinking coffee while writing– if it’s day time. Haha! At night, I just take cups of tea but there’s never any cute art in that. 😦 Or at least, I haven’t seen it yet. Very nice! Great to look at! I love Seattle, coffee and writing. Three of my favorite things. I lived in Seattle for many years and spent a lot of time in U District coffee shops before my husband got into grad school some where far away. Thanks for reminding me of great memories. 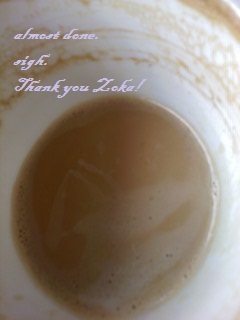 Those photo’s make me want to get a cup of coffee! Ever tried listening to music while you write? I can’t write without..
Also, I have a writing song of the day on my Facebook page. What music do you like to write to most? What a nice post that is! Very interesting how everybody has their preferences when it comes to writing. I pick a song that fits my mood, no matter what kind of genre it is. I’ve been listening to the Foo Fighters a lot lately. Oh noo! Hopefully they were recovered. Herbal, green, or black tea? Oh good! and… black tea is both dangerous and delicious! I just wanted to let you know that I really like your blog and I’ve added you to my blogroll list! Where could we talk about Jane Austen? I’d like to know what you think about the influence of her environment (woman condition, the enclosure of her house which keeps her off the big world) on her writing. I didn’t click for close-ups, but those pics are just fine! Many people are using their cell phones for photography lately (especially with all the iphone photo apps). On another note, I do like me some latte art! There’s bound to be someone out there reading your sips like they are tea leaves! Enjoy the Seattle coffee! Hot cocoa or tea with no milk with my scribbled in notebook. Ah. I love the pictures of your latte. I do drink coffee while posting. As a matter of fact I am enjoying a cup now! I am so glad the sun is out in Seattle. I bet the city looks beautiful. It does! The sun makes a huge difference! You know, I haven’t tried going to a coffee shop, ordering a cup and writing in a while. The last time I did proved to be one of my most productive writing ventures, and that was with company too. Really need to do that again! It definitely keeps me on track many days! I used to live in Seattle, and I’ve been to Zoka! I absolutely adore their latte art. Unfortunately, I was not writing at the time, so I did not get to experience the atmosphere in a creative way. Best wishes in the best city! What’s the point of opening a great coffee shop in Seattle when everyone, including myself, will happily settle for our favorite son, Starbucks, especially if you can find a wall outlet? I started getting really into Zeitgeist by the train station (something about ‘Z’s to help wake us up? ), but that may have been more about the hot sandwiches and bonus side salads, though the coffee is very good. Try the Polyclinic Deli on Capitol Hill for a superior cup, especially if you like Reubens. Yeah- wall outlets are always a major selling point! Cheers on the recommendations- I do like Zeitgeist pretty well, although I rarely go over by Pioneer Square these days. I do my best writing at that stage between dream and reality….no coffee, just sipping on twilight. The coffee looks delicious!!! 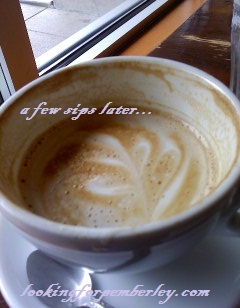 Love pictures of fancy coffee!! i have to have coffee to write, but i get so distracted when i’m actually at the coffeeshop because i’m always running into people I know! Tea, Honey, and a little Cream. The cat likes a little cream, too. I kind of like the “wordless wednesday” concept… says the girl who writes 3? 4? blogs? ?… 🙂 On my private blog, I did Wednesday Wonders for a long time…. sometimes it was more along the lines of “I wonder WTF that person was thinking….” to a situation, and sometimes it was a deep and profound “ah-ha” wonderment. So much fun, writing and sharing writing! Lol 🙂 Yeah- I can definitely understand why! I am not on a regular calendar with my postings, but I also feel like Wordless Wednesday was a genius idea. Keeping up with posts can be a lot of work! I love your latte-art photos! HA! I love the progress coffee photos. Very cute. My oldest son lived in Seattle for a while. He was just a few blocks away from Pike Place Market. Oh how I loved to visit there.